I noticed an auction of ghostroaster's in the Flora pattern that had a dish that I've never seen before. 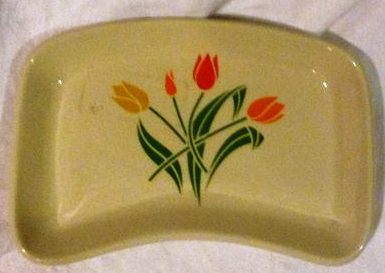 It has one side curved inwards and the other side curving outwards and the same shape was emailed to me today from an ebay listing, but it wasn't in the Flora pattern, but another pattern that I've never seen before. The listing says that it is super vitrified and has 78 on the backstamp. 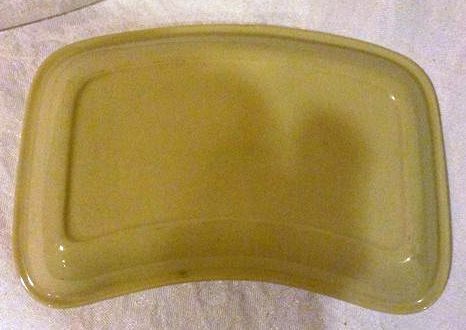 Can we please have you photo on the site please bopmum, so that we can ponder which shape that dish is and what is on the backstamp too? I did look for the shape couldn't find it, but also noticed that the base colouring is a little different. No numbers or markings. Excuse the quality of the photos, my ipad does not do too well in the evening. It's 8627 and it's called St Vincent's Dish - it was first made in Sept 1978 luckily there is a little drawing. It was made on the Ram Press.